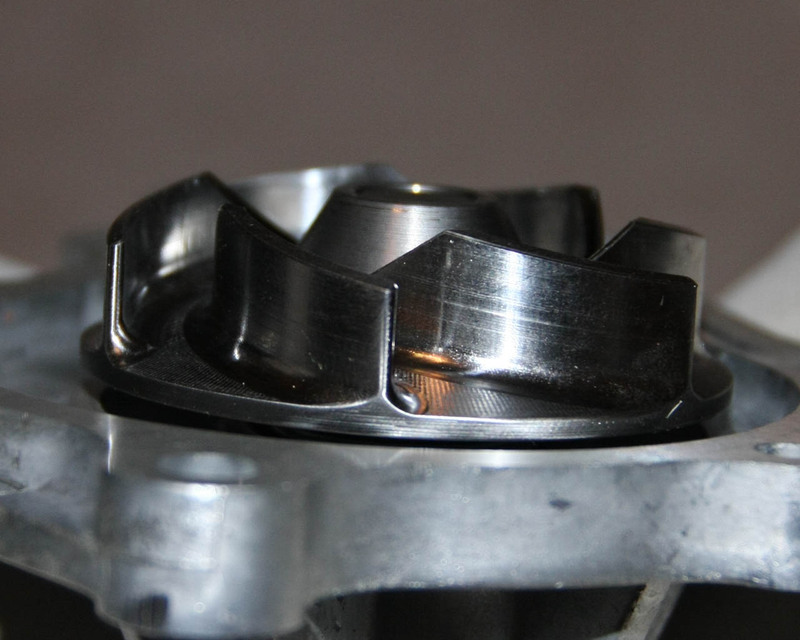 Are you scrapping your electric water pump project? Seems to be some debate whether this new water pump will make much of a difference to street driven 7's. Like Howard, I'm all for thermal efficiency, even if its a minor gain. My question is will having an underdrive pulley affect this pump or its efficiency in any way? IMO, increased WP flow will have the greatest effect on increasing the cooling efficiency of increased-capacity radiators, like the KOYO or Fluidyne, since that is where the water flow is slowest, and parts of the radiator are running at much lower temps, causing a reduction in cooling capacity. 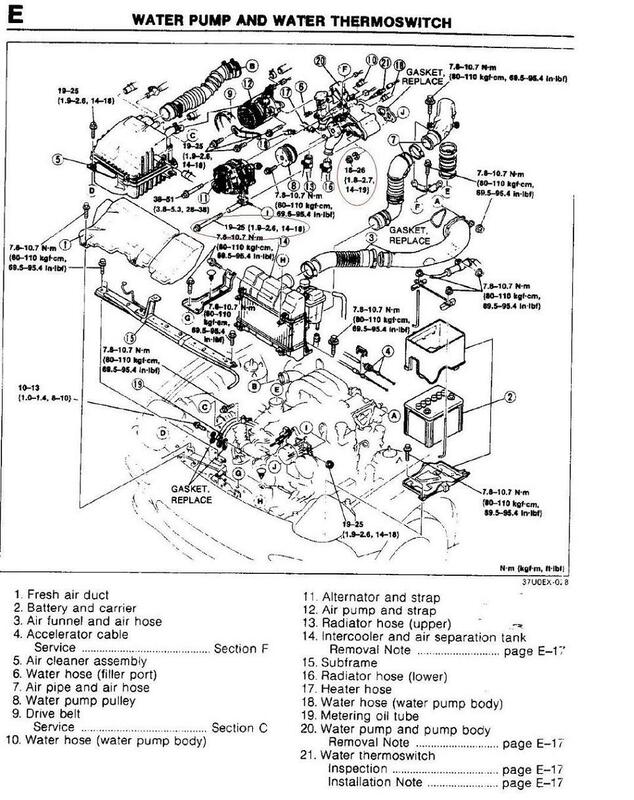 In the engine itself, also IMO, the coolant flow rates are probably sufficient with the stock pump. In every convective heat transfer calc that I can remember, increasing the fluid velocity offered an improvement. As a result, the coolant will be cooler in the engine block, and hotter in the radiator. Not sure if the bigger rads will benefit more. Heat exchanger calcs are multivariable and quite hard to predict with intuition. Certainly, you are correct. Higher flow rates always (barring cavitation caused by the higher flow) always result in better cooling. Of course, the engine thermal gradient will be smaller with increased flow. I did not say that NO benefit would occur with the stock rad, I just said that the greatest benefit would be for the larger rads. My reasoning goes along with people having more trouble cooling with KOYO's or Fluidynes in normal driving (lower coolant flow rates due to lower RPM's, plus the lower air velocities thru the rad due to lower MPH). That, IMO, goes directly to having the larger radiator winding up with a larger thermal gradient due to reduced flow rates. Last edited by DaveW; 03-10-08 at 12:43 PM. I'd be willing to test the performance against my stock water pump. Unfortunately the only "equipment" I have for that right now is a basic Autometer water temp gauge. So unless there is a clean way to put a flowmeter in the path of the pump output or some other 100% common path in the cooling system, or someone offers me free dyno time, I'll just have to rely on rough water temp comparisons. By rough I mean rough - the gauge isn't delineated much above 220F. Anyone with opinion/fact about using underdrive pulley with this pump, and its effect. Well, I just spoke to one of their engineers (Paul? ), exceedingly nice, and very cordial. The underdrive pulley will basically decrease the efficiency of the pump while gaining very little horsepower. 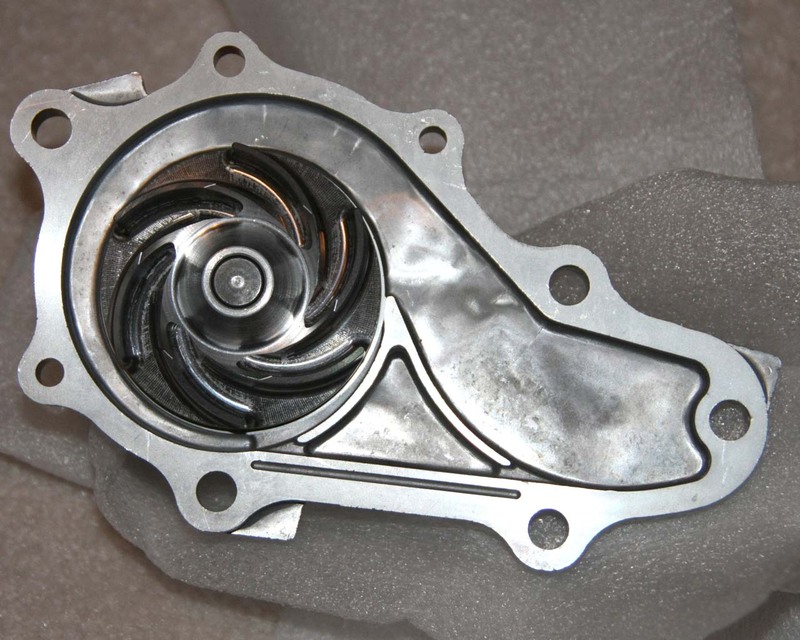 The pump will work best for extended periods of engine revving past 4K, as cavitation is less, and flow is more. Tolerances are much tighter, and anyone with 20B should consider this a must. That was basically it. So looks like when I rebuild my motor, I'll be going back to the OEM pulley. Does anyone have torque specs on the various water pump bolts handy? I'm having a rough time reading the tiny *** text in the FSM and making sure its pointing to the right bolts. I think that's only for the 12mm nuts/one bolt and not the 10mm ones from pump to housing.... Not sure. I knew I read the FSM wrong.... I definitely overtorqued the one at the alternator bracket. Yeah that's my point....seems high. And I'm the same way, all the short block engine assy. I use a torque wrench + a few other things but most the time it's done by my trusty "elbow torque wrench"
...anyone with 20B should consider this a must. I'd like to have Carlos Lopez of CLR Motorsports chime in on this. He's got a lot of this r&d (water pump specifically) under his belt. while there are certain bolts where i always use a torque wrench, the water pump housing isn't one of them. Howard, you are usually very precise on everything you say, but are you sure this is correct? Could it be 14-19 N-meters or some other units? This torque sounds too high to me for the smaller bolts, also. 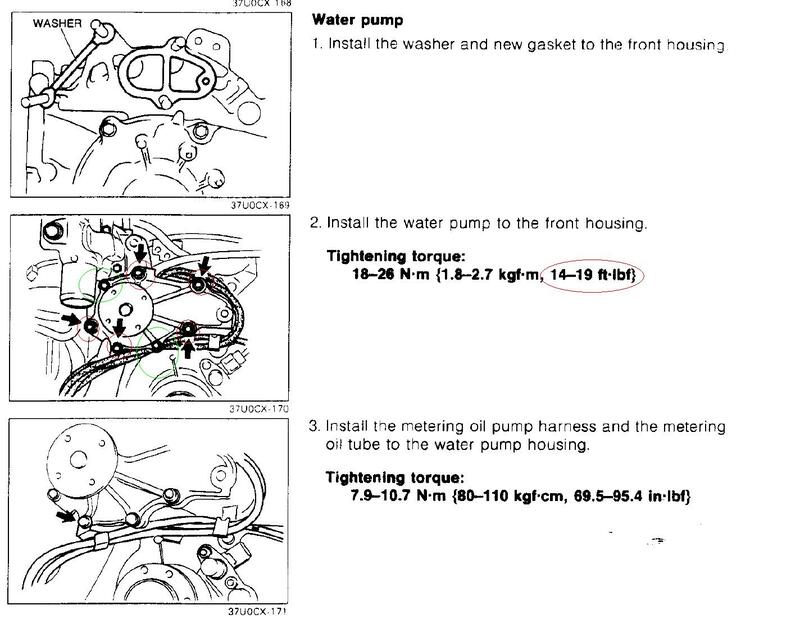 Page E16 of the 93 FSM shows the 12mm nut and washer and a torque rating. It looks to be 14-19 but it looks like "in-fts". It does not show a torque rating for the 10mm bolts unless I missed it. Furthermore, it shows another different torque rating for the long bolt on the far right that goes through the alternator bracket and water pump. If I read it correctly, it starts at 69. I know now that I read it wrong as none of the values look to be in traditional lb/ft settings. I probably should have used the first value which appears to be in Newton Meters (NM). I only recently started using a torque wrench so I could do things "right". Looks like the right tool in the wrong hands. I wasn't doubting Howards post, just wanted to know if the torque was for the 12mm nut(s), 12mm bolt, and 10mm bolt(s).....I found my answer and FYI Howards torque quote was right on for the 12mm but the 10mm ones say 69.5-95.4 in. lbs. (5.79-7.95 ft. lbs.) found in FSM C-79. Thanks for the look-up. I was afraid someone would break/strip one of the 10-mm bolts trying to get to 19 lb-ft. I read the whole thread and I still couldn't figure out if this is better for daily street driving or for track. I have a Koyo radiator.